Researchers at the University of Chicago and Argonne National Laboratory have invented an innovative way for different types of quantum technology to “talk” to each other using sound. The study, published Feb. 11 in Nature Physics, is an important step in bringing quantum technology closer to reality. Researchers are eyeing quantum systems, which tap the quirky behavior of the smallest particles as the key to a fundamentally new generation of atomic-scale electronics for computation and communication. But a persistent challenge has been transferring information between different types of technology, such as quantum memories and quantum processors. “We approached this question by asking: Can we manipulate and connect quantum states of matter with sound waves?” said senior study author David Awschalom, the Liew Family Professor with the Institute for Molecular Engineering and senior scientist at Argonne National Laboratory. One way to run a quantum computing operation is to use “spins”—a property of an electron that can be up, down or both. Scientists can use these like zeroes and ones in today’s binary computer programming language. But getting this information elsewhere requires a translator, and scientists thought sound waves could help. “The object is to couple the sound waves with the spins of electrons in the material,” said graduate student Samuel Whiteley, the co-first author on the paper. “But the first challenge is to get the spins to pay attention.” So they built a system with curved electrodes to concentrate the sound waves, like using a magnifying lens to focus a point of light. The results were promising, but they needed more data. To get a better look at what was happening, they worked with scientists at the Center for Nanoscale Materials at Argonne to observe the system in real time. Essentially, they used extremely bright, powerful X-rays from the lab’s giant synchrotron, the Advanced Photon Source, as a microscope to peer at the atoms inside the material as the sound waves moved through it at nearly 7,000 kilometers per second. Argonne nanoscientist Martin Holt took X-ray images of the acoustic waves with the Hard X-ray Nanoprobe at the Center for Nanoscale Materials and Advanced Photon Source, both at Argonne. Image courtesy of Argonne National Laboratory. It’s normally difficult to send quantum information for more than a few microns, said Whiteley—that’s the width of a single strand of spider silk. This technique could extend control across an entire chip or wafer. “The results gave us new ways to control our systems, and opens venues of research and technological applications such as quantum sensing,” said postdoctoral researcher Gary Wolfowicz, the other co-first author of the study. The discovery is another from the University of Chicago’s world-leading program in quantum information science and engineering; Awschalom is currently leading a project to build a quantum “teleportation” network between Argonne and Fermi National Accelerator Laboratory to test principles for a potentially unhackable communications system. The scientists pointed to the confluence of expertise, resources and facilities at the University of Chicago, Institute for Molecular Engineering and Argonne as key to fully exploring the technology. Other coauthors on the paper are Assoc. Prof. David Schuster, and Prof. Andrew Cleland; Argonne scientists Joseph Heremans and Martin Holt; graduate students Christopher Anderson, Alexandre Bourassa, He Ma and Kevin Satzinger; and postdoctoral researcher Meng Ye. The devices were fabricated in the Pritzker Nanofabrication Facility at the William Eckhardt Research Center. Materials characterization was performed at the UChicago Materials Research Science and Engineering Center. 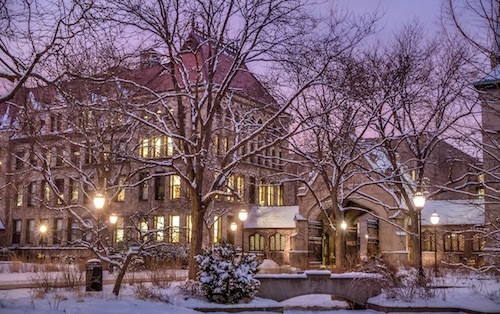 The University of Chicago is an urban research university that has driven new ways of thinking since 1890. Our commitment to free and open inquiry draws inspired scholars to our global campuses, where ideas are born that challenge and change the world. We empower individuals to challenge conventional thinking in pursuit of original ideas. Students in the College develop critical, analytic, and writing skills in our rigorous, interdisciplinary core curriculum. Through graduate programs, students test their ideas with UChicago scholars, and become the next generation of leaders in academia, industry, nonprofits, and government. 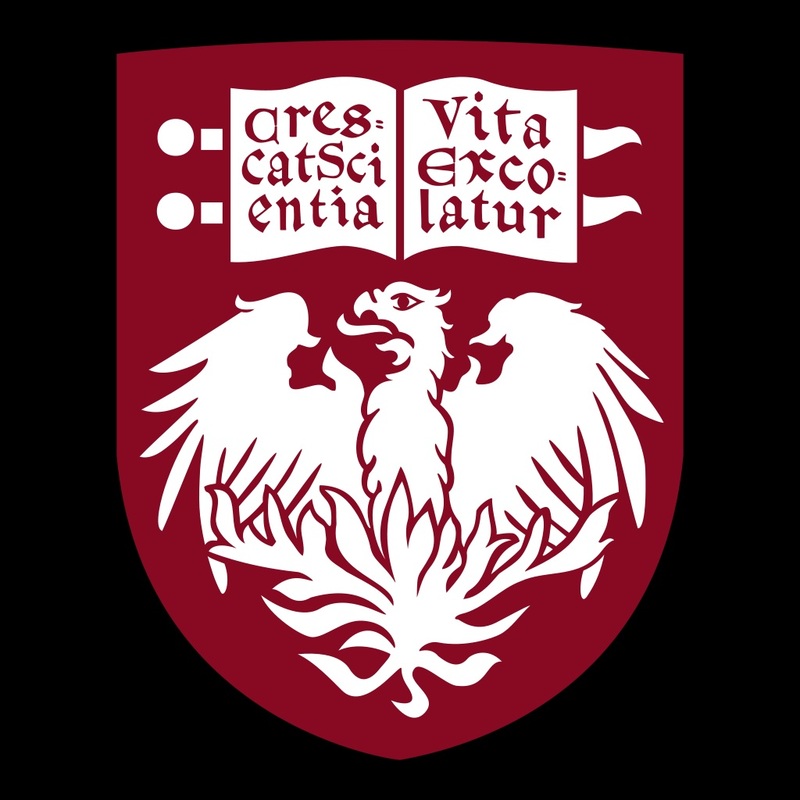 UChicago research has led to such breakthroughs as discovering the link between cancer and genetics, establishing revolutionary theories of economics, and developing tools to produce reliably excellent urban schooling. We generate new insights for the benefit of present and future generations with our national and affiliated laboratories: Argonne National Laboratory, Fermi National Accelerator Laboratory, and the Marine Biological Laboratory in Woods Hole, Massachusetts. The University of Chicago is enriched by the city we call home. In partnership with our neighbors, we invest in Chicago’s mid-South Side across such areas as health, education, economic growth, and the arts. Together with our medical center, we are the largest private employer on the South Side. In all we do, we are driven to dig deeper, push further, and ask bigger questions—and to leverage our knowledge to enrich all human life. Our diverse and creative students and alumni drive innovation, lead international conversations, and make masterpieces. Alumni and faculty, lecturers and postdocs go on to become Nobel laureates, CEOs, university presidents, attorneys general, literary giants, and astronauts. From Fermi National Accelerator Lab , an enduring source of strength for the US contribution to scientific research world wide. The U.S. Department of Energy announced today that it has awarded scientists at its Fermi National Accelerator Laboratory more than $10 million to spur research that could revolutionize not only our understanding of nature, but also the very way we investigate it. Quantum science is a cutting-edge field of research made possible through the unique effects of quantum physics. The best known examples are quantum computing, quantum sensors and quantum teleportation, all of which Fermilab researchers will be working on in the coming years. This work – and the technology that enables it – is beyond complex, but Fermilab’s scientists and engineers, in partnership with other institutions and industry, have discovered new ways to make use of quantum effects to understand the universe. As part of a number of grants to national laboratories and universities through its Quantum Information Science-Enabled Discovery (QuantISED) program, DOE’s funding to Fermilab scientists cover five initiatives (listed below) and will be distributed over two years. It also funds Fermilab’s participation in three further initiatives led by other institutions. The quantum science funding announcement follows on the heels of a first-of-its-kind quantum workshop held earlier this month at Fermilab. With participants from academia and industry, it featured Google’s first quantum software tutorial in a public setting. The hands-on nature of the workshop and the face-to-face interaction among researchers from tech companies, national laboratories and universities made it an incubator for new ideas, discussions and problem-solving in quantum computing. Fermilab is also preparing to participate in the Chicago Quantum Exchange Summit, to be held at the University of Chicago on Nov. 8 and 9. Fermilab, the U.S. Department of Energy’s Argonne National Laboratory and the University of Chicago form the core of CQE, a partnership that will facilitate the exploration of quantum information and the development of new applications with the potential to dramatically improve technology for communication, computing and sensing. The summit will include representatives from the technical and academic sector. It will also serve as a testament to both academia’s and industry’s serious, burgeoning interest in quantum science. Scientists have so far come up empty in the search for dark matter, the mysterious and as-of-yet undetectable substance that makes up a quarter of our universe. 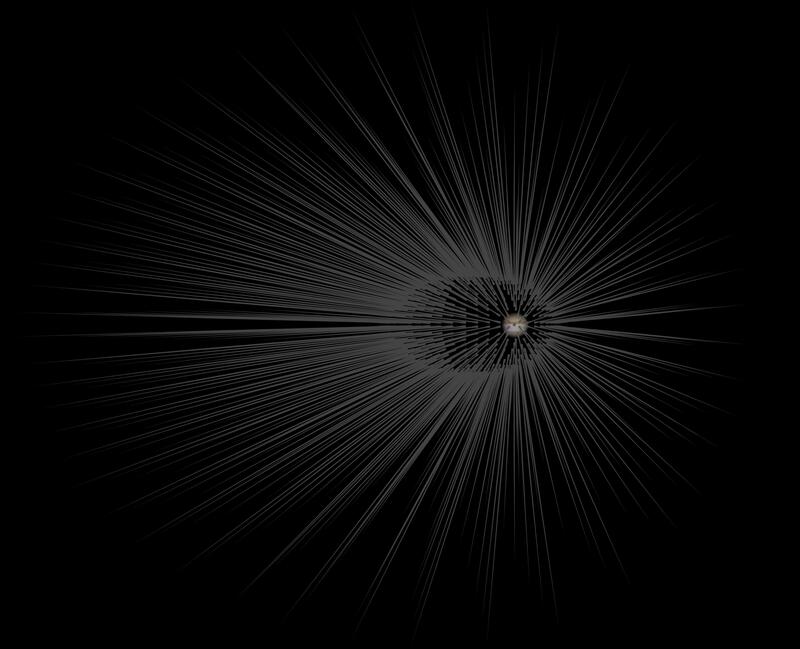 One theory suggests that dark matter might be made of exotic particles called axions. Fermilab researchers are part of a team using superconducting qubits – basic circuit elements of quantum computers that are able to detect a single photon of light – that will enable further experiments searching for axion particles. Fermilab scientists are using ultraefficient superconducting radio-frequency resonators – one of the core technologies for advancing particle accelerators – to significantly increase a quantity known as coherence time. Coherence time is how long a superposition of quantum states survives before it collapses into a single state. The longer the coherence time, the more is available for a quantum system to perform operations. Researchers are working to increase the resonators’ ability to retain energy — characterized by its quality factor — and thus the achievable coherence times. 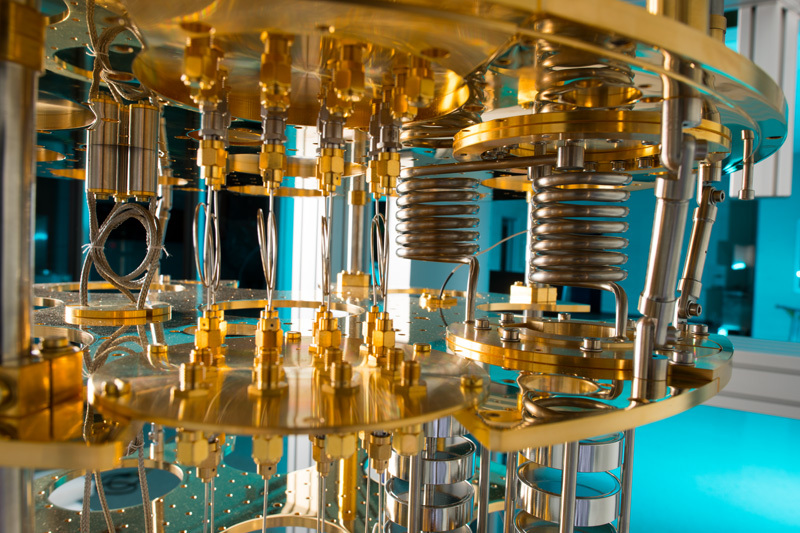 One of the main goals of this program is to demonstrate qubits with ultrahigh quality factors and long coherence times, ultimately putting a number of them together into a multiqubit, “quantum computer”-type system. The same technology will be used for experiments aimed at searching for dark photons, a particular kind of dark matter particle. Researchers are using simulated quantum computers to enable computations for particle physics theory, integrating them into existing computing infrastructure to make complex and difficult calculations easier and faster. These simulations are opening avenues for physicists to address a whole new class of physics problems that were previously out of reach with classical computers. Machine learning is the science of teaching computers to solve problems and fill in blanks on their own. Quantum computers are the next step in machine learning and can help make connections between pieces of information and learn how strong those connections should be. Classical computers have made great strides in this field, but quantum computers will allow scientists to build more sophisticated and powerful models of physical reality. Scientists have developed a next-generation version of the charge-coupled device, or CCD, that’s in your home camera. This sensitive new technology, the skipper CCD, has the potential to exploit the quantum nature of light to capture images of objects with exceptional resolution. Thanks to the technology’s heightened sensitivity, the skipper CCD could image objects one photon at a time, increasing the clarity of the signal in quantum imaging experiments. Scientists are designing a skipper CCD optimized for such an application. They’re also exploring the quantum entanglement of photons as a tool to look for dark photons, a hypothetical particle related to dark matter. Researchers have devised a way to use a phenomenon called quantum entanglement to send information over long distances. The first step toward that goal is called the Fermilab Quantum NETwork (FQNET) Teleportation Experiment, which will use a quantum network using commercial optical fibers to “teleport” information across several kilometers. This program also explores the connection of quantum teleportation protocols with deep mysteries of space-time physics that include black holes and wormholes. Machine learning algorithms have had a huge impact on the areas of pattern matching and classification. Applications at Fermilab including classifying different types of neutrino interactions in detectors, determining a particle’s path from a string of hits in a tracking chamber, and separating stars from galaxies in astrophysics sky surveys. With increased data volumes, scientists will require better data access methods, so researchers are also exploring the use of quantum computers for very fast data indexing and recall. Neutrinos are fleeting, elusive subatomic particles that may hold the key to the mystery of why we live in a matter-dominated universe. Scientists study neutrino interactions to get a better understanding of what trace the mysterious particles will leave in neutrino experiments like the Deep Underground Neutrino Experiment (DUNE), hosted by Fermilab. Quantum computers may be ideal for simulating the detailed outcomes of neutrino with complex, heavy nuclei, which are themselves quantum systems. The cosmological search in the dark is no walk in the park. With help from Berkeley Lab’s NERSC, Fermilab [FNAL] aims open-source software at data from high-energy physics. Proposed filaments of dark matter surrounding Jupiter could be part of the mysterious 95 percent of the universe’s mass-energy. Image courtesy of NASA/JPL-Caltech. Most of the universe is dark, with dark matter and dark energy comprising more than 95 percent of its mass-energy. Yet we know little about dark matter and energy. To find answers, scientists run huge high-energy physics experiments. Analyzing the results demands high-performance computing – sometimes balanced with industrial trends. After four years of running computing for the Large Hadron Collider CMS experiment at CERN near Geneva, Switzerland – part of the work that revealed the Higgs boson – Oliver Gutsche, a scientist at Department of Energy’s (DOE) Fermi National Accelerator Laboratory, turned to the search for dark matter. To learn about dark matter, Gutsche needs more data. Once that information is available, physicists must mine it. They are exploring computational tools for the job, including Apache Spark open-source software. In searching for dark matter, physicists study results from colliding particles. “This is trivial to parallelize,” breaking the job into pieces to get answers faster, Gutsche explains. “Two PCs can each process a collision,” meaning researchers can employ a computer grid to analyze data. To search for dark matter, scientists collect and analyze results from colliding particles, an extremely computationally intense process. 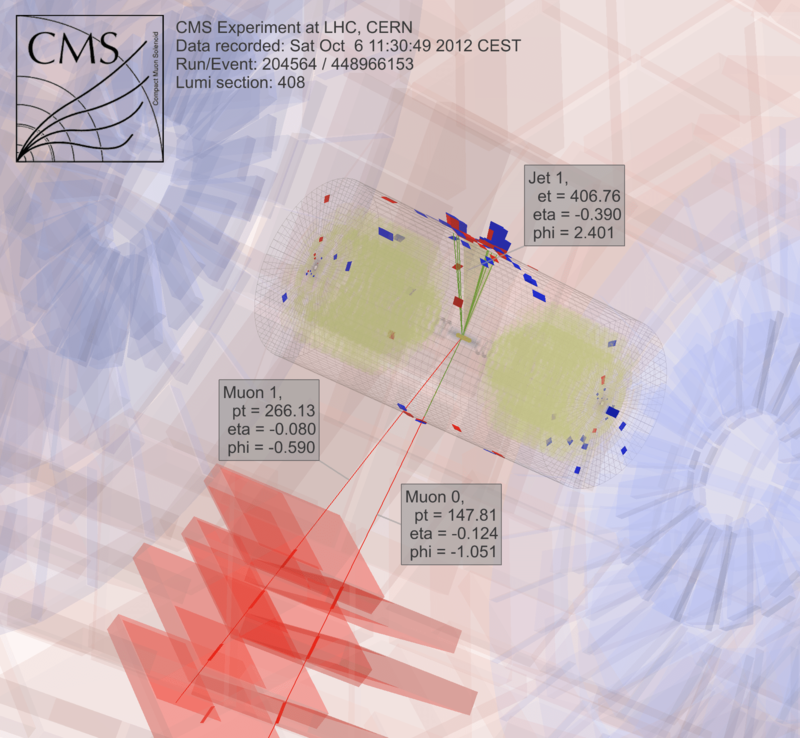 Image courtesy of CMS CERN. Spark is a data-reduction tool made for unstructured text files. That creates a challenge – accessing the high-energy physics data, which are in an object-oriented format. Fermilab computer science researchers Saba Sehrish and Jim Kowalkowski are tackling the task. Spark offered promise from the beginning, with some particularly interesting features, Sehrish says. “One was in-memory, large-scale distributed processing” through high-level interfaces, which makes it easy to use. “You don’t want scientists to worry about how to distribute data and write parallel code,” she says. Spark takes care of that. Another attractive feature: Spark is a supported research platform at the National Energy Research Scientific Computing Center (NERSC), a DOE Office of Science user facility at the DOE’s Lawrence Berkeley National Laboratory. “This gives us a support team that can tune it,” Kowalkowski says. Computer scientists like Sehrish and Kowalkowski can add capabilities, but making the underlying code work as efficiently as possible requires Spark specialists, some of whom work at NERSC. In short, he and Sehrish want to build a system allowing researchers to run an analysis that performs extremely well on large-scale machines without complications and through an easy user interface. The starting data for the dark-matter implementation are formatted for high-throughput computing platforms, but Spark doesn’t handle that configuration. So software must read the original data format and convert it to something that works well with Spark. In fact, Spark itself changes. Its extensive open-source use creates a constant and rapid development cycle. So Sehrish and Kowalkowski must keep their code up with Spark’s new capabilities. “The constant cycle of growth with Spark is the cost of working with high-end technology and something with a lot of development interests,” Sehrish says. It could be a few years before Sehrish and Kowalkowski make a decision on Spark. Converting software created for high-throughput computing into good high-performance computing tools that are easy to use requires fine tuning and team work between experimental and computational scientists. Or, you might say, it takes more than a shot in the dark. A DOE Office of Science laboratory, Fermilab [FNAL] is located near Chicago, Illinois, and operated under contract by the Fermi Research Alliance LLC. The DOE Office of Science is the single largest supporter of basic research in the physical sciences in the United States, and is working to address some of the most pressing challenges of our time. For more information, please visit http://science.energy.gov.